Hydroids are tiny jellyfish-like creatures that infest tanks with low flow, such as seahorse fry tanks and larval rearing vessels. The bad news is, they can sting and kill dwarf seahorses and fish fry that get too close to them. 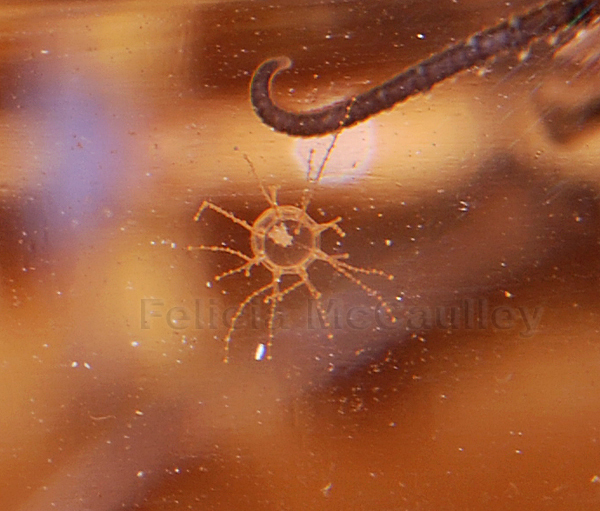 Hydroids love to eat baby brine shrimp and can be introduced to the tank on almost anything, including the shells of brine shrimp eggs. There are a couple things you can do to prevent contamination of your tank with hydroids. Make sure you are using decapsulated brine shrimp eggs, or decapsulate them yourself. You can buy already decapsulated brine shrimp from seahorsesource.com. Your best weapon against hydroids is a drug called Fenbendazole (Panacur). However, you should familiarize yourself thoroughly with this drug before using, or better yet, talk to your veterinarian first. Reeftools and its colleagues can not be held responsible for any result of you reading this blog and using Fenbendazole. Personally, I’ve used this drug safely with dwarf seahorses and Fundulus heteroclitus Killifish. I’ve read that it can be safely used with other fish fry such as Clownfish. In low doses it can be safe for clean up crews such as Nassarius snails, cleaner shrimp, and hermit crabs. Be careful and do lots of research before using Fenbendazole. Any living creatures or plants you want to add to your dwarf seahorse or fry tank should be treated with Fenbendazole first. Keep in mind, most invertebrates and corals DO NOT tolerate Fenbendazole and will die. Macroalgae such as Caulerpa and Chaetomorpha as well as the beneficial nitrifying bacteria in live rock handle treatment with the drug very well. Fenbendazole is by no stretch of the imagination considered to be reef safe. So don’t dose your reef tank with this stuff. Fenbendazole also tends to absorb into glass and rock, leaching into your tank forever. The granules seem to leach worse than the liquid does. What should you do if you find hydroids in your dwarf seahorse tank or fry tank? Fish seem to tolerate Fenbendazole treatments well. Unfortunately, hydroids don’t even flinch from other common parasite treatments like low salinity, Praziquantel, or formalin baths. So far only Fenbendazole has proven an effective treatment. Where can you get Fenbendazole? There are plenty of online or local farm animal feed stores that carry it. I use Safe-Guard Fenbendazole/liquid Goat Wormer by Intervet (fenbendazole) Suspension 10% (100 Mg/ml). It’s very important to choose one that is not flavored. Make sure you have done plenty of research and are aware of the risks of using this medication before you proceed. The dosage for fry tanks is 0.2 ml per 10 gallons. Repeat the dosage every other day for a total of three dosages. By the third dose, all hydroids should be dead. Fenbendazole can also eradicate Aiptasia, bristleworms, and other marine worms.